She’s all over the place right now. Gorgeously attired in shades of white, rose-pink, lavender and purple. She wanders into gardens, meadows, landfills. She hitchhikes along roadways. She lines the pond, and the forest, and the parking lot at the mall. Now what about this Dame—who is she? It’s remarkable that so many plants have a female in their name. Dame’s Rocket. Lady’s-slippers. Virgin’s-bower. Lady’s mantle. Lady fern. Recently (in the last two thousand years or so) plants were often named to honor the Virgin Mary in the Christian tradition. But many plants have been associated with a female goddess since long before Christianity. The goddess/woman/dame the name refers to is lost in the mists of time. This plant is also called Wandering Lady because it really seems to migrate, popping up in new places every year. But of course it’s the seeds that do the travelling. 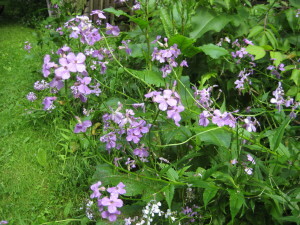 Dame’s Rocket, like all mustards, has long thin seed pods that produce abundant seeds, and they reseed promiscuously in all sorts of places. So you never know where the wandering lady will appear. Alas, this beautiful wanderer is starting to be recognized as an invasive species. It’s not native to the US, and its prolific growth can choke out native wildflowers. Since it’s somewhat shade-tolerant, it can elbow its way into forests and become a real problem. 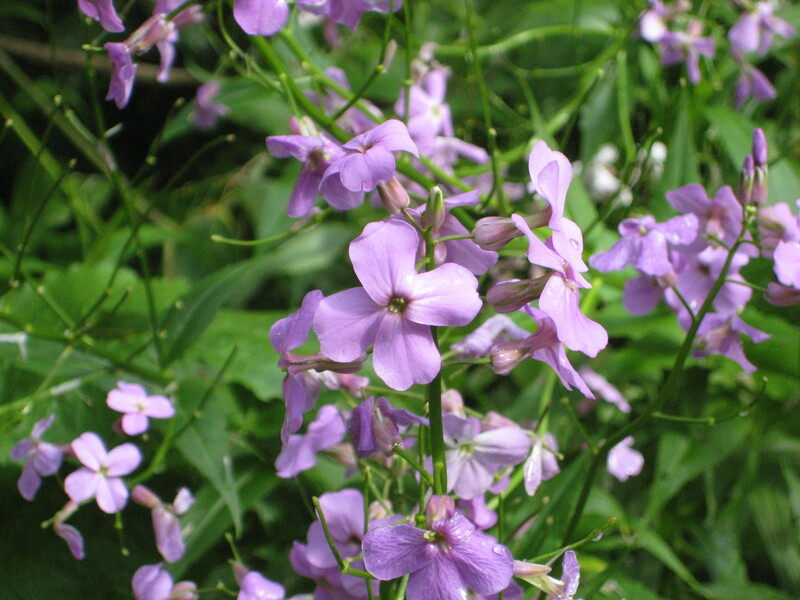 So this is not a good flower to plant in your garden, even though you can buy dame’s rocket seed, and it’s often included in those awful meadow-in-a can wildflower mixtures. If you live near an undisturbed ecosystem, it’s important to keep control of dame’s rocket. I’ve watched the wandering lady meander around my farm for thirty years, springing up in a new spot each summer. It always seems to linger in the meadow among the burdock and goldenrod. If I uproot the dame’s rocket, it’s likely something worse will move into the void. Disturbed soil is a fertile ground for aggressive invasives—garlic mustard, oriental bittersweet, honeysuckle, multiflora rose—that can gobble up whole acres of land. So for now I’ll leave the dame’s rocket alone and enjoy her pink and purple beauty.